This is the best premium-compact crossover for you if you want a “jack-of-all-trades” that asks little of its owner in return. Acura’s entry-level crossover, the RDX seats five and borrows elements of its underskin engineering from the 2012-2016 CR-V produced by corporate-parent Honda. The RDX stands out for its enticing blend of room and comfort, and pricing that undercuts most of the competition by thousands of dollars. It comes with a smooth V-6 engine — most rivals offer only turbocharged four-cylinder engines – and an outstanding reputation for reliability. The RDX is completely unchanged for 2018; there aren’t even any new paint colors. It was the premium-compact-crossover segment’s sales leader in 2016, but 2017 has been less kind. In a class up about 4 percent overall through the first quarter of 2017, RDX sales were off more than 18 percent. That put in third, behind the BMW X3 and the redesigned 2018 Audi Q5. Wait for the 2019 if you want the all-new, next-generation RDX. It’ll likely remain about the same size and continue to seat five. But it’ll have new styling and probably will join the crowd, shelving its V-6 for a more fuel-efficient turbo four-cylinder. 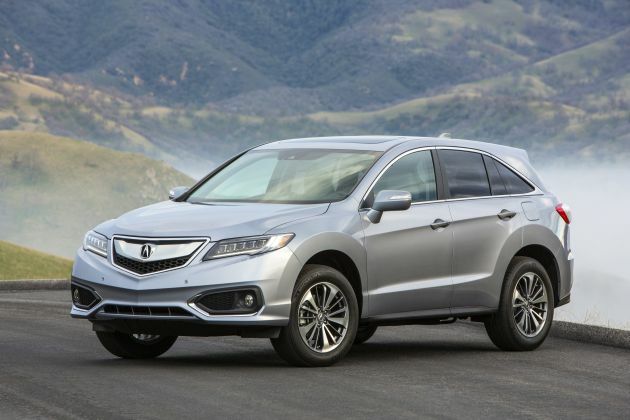 Buy a 2018 RDX if you’re fond of its looks, like the idea of a V-6, and hanker to exploit model-year closeout sales as Acura and its dealers clear inventories to make way for the all-new 2019 version. Today’s RDX design debuted for model-year 2013 and was facelifted for ’16. There’s little fundamentally wrong with it, and there’s plenty appealing about the linear power a V-6 compared with the lags and surges that can detract from turbocharged-four-cylinder driving experience. The ’18 RDX lineup reprises five levels of trim, defined by an escalating suite of features. Building on the Base model are the RDX with the AcuraWatch Plus Package; the RDX with Technology Package; the RDX with the Technology and AcuraWatch Plus packages; and the top-line RDX with Advance Package. Details are below, but each again comes with a choice of front-wheel drive or all-wheel drive (AWD). It’s unaltered. 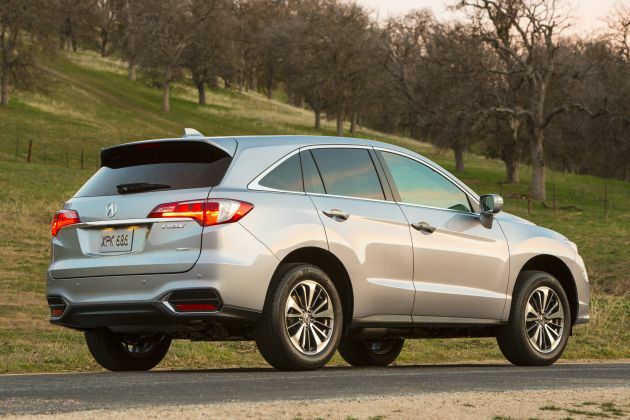 The ’18 RDX continues the styling updates it received for the 2016 model year, which included a freshened front end that incorporated LED headlights in Acura’s “jewel-eye” design theme as standard. Also evident are that update’s new wheel designs and tweaked rear fascia. For 2017, two new metallic paint colors – Lunar Silver and Modern Steel – were made available, along with a black interior for models in the popular White Diamond Pear color. For 2018, leather upholstery is again included on models with the Technology and Advance packages; other versions use a leatherette substitute. Heated front seats are standard across the board. Room and comfort, both front and rear, are generous for the class. Cargo volume is also near the top of the competitive set, at 26.1 cubic feet with the rear seatbacks up and 61.3 with them folded. RDX’s more expensive German rivals best it for interior-materials quality, but the Acura is just fine for its price. The infotainment and available navigation system utilize two separate screens for audio, climate, and map data. That cuts down on button clutter, but creates an odd redundancy to information that can be displayed. Accessing some audio and climate data through the primary touchscreen can require a distracting drill through sub-menus. Again, no changes for ’18. The sole engine is Honda’s unruffled 3.5-liter V-6 with 270 horsepower and 252 pound-feet of torque. It’s paired with a 6-speed automatic transmission, which, in a class increasingly populated with 8-, and 9-speed automatics, feels a little out of date. It has no obvious flaws, but there’s a sense it hampers the driver’s ability to wring the most out of the fine engine. Acura’s Super Handling All-Wheel Drive (SH-AWD) is a $1,500 alternative to front-wheel drive. It’s one we highly recommend, even if you don’t live where it snows. The RDX can’t fully match the precise nature of its German-engineered rivals, such as the Audi Q5, BMW X3, or Mercedes-Benz GLC. But SH-AWD helps give it a touch of the rear-wheel-drive-based road manners that defines the best of the European premium crossovers. The RDX keeps on keepin’ on, with no changes to standard or optional equipment for 2018. The entry-level Base model includes heated front seats, 10-way power driver’s seat, dual-zone automatic climate control, a power rear liftgate, steering-wheel paddle shifters, and multi-angle rearview camera. The four other grades are defined by a different package of features. Per Honda/Acura tradition, there are no standalone factory options, and the different packages are priced as separate models. The AcuraWatch Plus Package includes a number of driver-assistance features, including radar-based adaptive cruise control, forward-collision warning with autonomous emergency braking, and lane-departure alert with automatic steering correction. RDX models so equipped receive the prestigious Top Safety Pick+ award from the influential Insurance Institute for Highway Safety. The Technology Package adds the following to the Base: unique interior trim, 8-way power operation for the front-passenger seat, blind-spot alert with rear cross-traffic detection, supplementary touchscreen for infotainment controls, imbedded GPS navigation, and Acuralink telematics. Note that this package by itself does not include any of the AcuraWatch Plus features – they’re part of a separate model entirely. The top-line Advance Package includes everything in the Technology and AcuraWatch Plus packages plus fog lights, rain-sensing windshield wipers, remote engine start, front- and rear-obstacle detection, and ventilated front seats. Even with a modest price hike of less than $500 per model, the 2018 RDX remains among the most affordable premium-compact crossovers. Prices here include Acura’s $975 destination fee; add $1,500 to all models for SH-AWD. With front-wheel drive, the Base RDX is priced at $36,775. The RDX with the AcuraWatch Plus Package is $38,075 and with the Technology Package, it’s $40,475. The RDX that combines the Technology and AcuraWatch Plus packages is priced at $41,775. The fully loaded RDX Advance Package is priced at $43,475. Our pick for the best 2018 RDX value? With a sticker price of $43,275, it’s an SH-AWD version with Technology and AcuraWatch Plus packages. You get a fairly comprehensive set of safety and convenience features at a price that undercuts similarly equipped rivals by up to $10,000 – even more in some instances. Note that Acura is one of the few premium-brand automakers that does not offer any sort of complimentary factory-scheduled maintenance. Unchanged for model-year ’18, RDX’s EPA fuel-economy ratings are good for a V-6 crossover – although they do fall just short of rivals with turbocharged fours and transmissions with seven or more speeds. The 2018 RDX rates 20/28/23 mpg city/highway/combined with front-wheel drive and 19/27/22 with AWD. Premium-grade 91-octane gasoline is required. With an early 2018 release expected, the 2019 RDX will share some of its engineering with Honda’s all-new 2017CR-V. It will almost certainly ditch the current RDX’s’ V-6 for a turbocharged four-cylinder likely displacing 2.0 liters and producing around 250 horsepower and 280 pound-feet of torque. Its transmission could be a continuously variable automatic (as in the CR-V), an 8-speed dual-clutch automatic (from Acura’s TLX midsize sedan), or a 9-speed automatic (also from the TLX). Acura might even mix it up a bit, offering the dual-clutch on front-drive models and the 9-speed with AWD. The next-generation RDX is also a strong candidate for a hybrid or plug-in hybrid powertrain option, although not in its initial model year. Buick Envision, which has less room inside, doesn’t handle as well, costs more when comparably equipped, and — being imported from China — is unproven for reliability and resale value; the BMW X3, which boasts sportier road manners but a dated design and suffers BMW’s nickel-and-dime approach to add-ons, maing it more costly than it probably should be; and the high-fashion Range Rover Evoque, which handles reasonably well but suffers from a gruffer powertrain, higher prices, and a small interior. Audi Q5, an all-new 2018 model that, when optioned modestly to keep costs in check, is a step up in prestige; the Jaguar F-Pace, which boasts seductive styling, exceptional road manners, and a far wider model range; and the Mercedes-Benz GLC, which justifies its steeper prices with a blend of quality, comfort, and choice unmatched in the class.